Pakistan may be making headlines – but Butterfly is set to conquer the world. 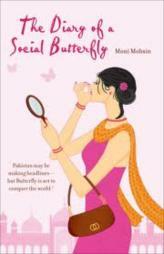 Meet Butterfly, Pakistan’s most lovable, silly, socialite. An avid partygoer, inspired misspeller, and unwittingly acute observer of Pakistani high society, Butterfly is a woman like no other. In her world, SMS becomes S & M and people eat ‘three tiara cakes’ while shunning ‘do number ka maal’. ‘What cheeks!’ as she would say. As her country faces tribulations – from 9/11 to the assassination of Benazir Bhutto – Butterfly glides through her world, unfazed, untouched, and stopped short only by the chip in her manicure. Wicked, irreverent and hugely entertaining, The Diary of a Social Butterfly gives you a delicious glimpse into the parallel universe of the have-musts. Moni Mohsin is the author of The End of Innocence. She writes a popular column called ‘Diary of a Social Butterfly’ for Pakistan’s Friday Times, selections of which make up this, her second book. She grew up in Lahore and now divides her time between Lahore and London, where she lives with her husband and two children.